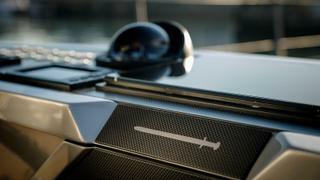 The experienced owner of Sorceress had already owned a series of boats — ranging from a Class 40 that he raced two-handed with a friend to a 24 metre custom carbon yacht — when he went shopping for his next one. “He approached Southern Wind because he was interested in a yacht from our SW94 series,” says Andrea Micheli, commercial director at Pegaso, Southern Wind’s Genoa-based marketing, sales and customer care representatives. The thinking behind the SW96 largely came from the sparky mind of Southern Wind’s founder, Willy Persico. “Projects have to be updated continuously,” he says, patting down a cloud of unruly white hair. “I have always looked beyond our successful series like the 72 and the 100 to see what the future will hold. 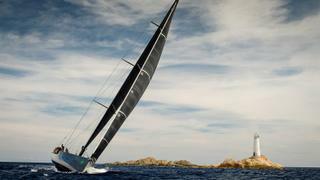 His yachts are well known for being as much fun to helm during regattas as they are dependable during long distance cruises. 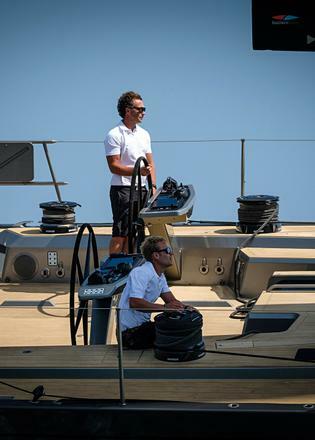 “I build the kinds of yachts that I myself like,” says Persico. 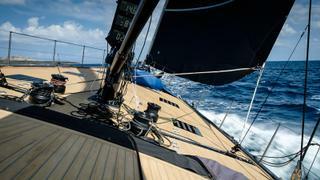 “I want my yacht to be fast, fun, safe and seaworthy, but I don’t want to sacrifice comfort. By studying and developing carbon infusion construction methods we have found a good speed-to-comfort ratio. Micheli’s follow-up conversation with Sorceress’s owner led to an invitation for a long weekend at the client’s North American home. 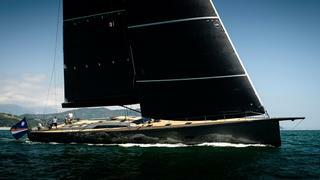 “I went with Jim Schmicker, vice president of Farr Yacht Design who did the SW96 naval architecture. The setting couldn’t have been more beautiful: a house overlooking a huge tidal bay. It was a really familial atmosphere, where we cooked and enjoyed long dinners together, but we also got under the hood of the new project. Sorceress is the first Southern Wind yacht with twin rudders; the decision to mount them was made for both functional and aesthetic reasons. As Schmicker explains: “A single rudder would have significantly compromised performance and handling when the keel was lifted, while twin rudders complement both the lifting keel and the wider hull style. 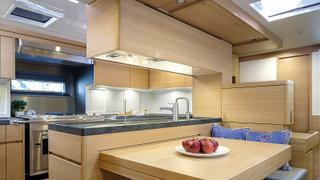 The owner wanted to marry this on-water performance with a sporty deck layout — clean, modern and as safe as possible. 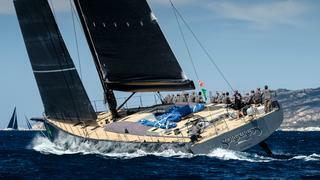 As Sorceress cruises with a permanent crew of just four, deck hardware has been optimised for both shorthand performance cruising and offshore racing. The fixed bowsprit has an integrated anchor arm and a fitting for a gennaker tack line. This, combined with a furling Code Zero, allows for flexibility and practical sailing manoeuvres. Transverse jib tracks ensure fast trimming and precise sail handling while racing. The Southern Spars mast mounts a North Sails 3Di mainsail complemented by Cariboni Magic Trim that leaves the deck free of sheets. While from the outside Sorceress’s aggressive lines and set-up seem to say “let’s move”, below deck the atmosphere is more “sit down and stay a while”. The interior layout features a large open-plan saloon with sweeping views and light through the portlights and coachroof windows. 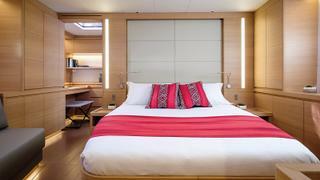 The en-suite owner’s cabin is forward, with a private office area, and there are three en-suite guest cabins amidships. 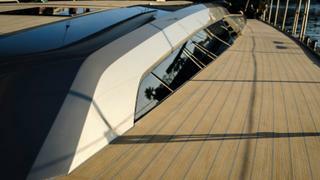 Like all recent Southern Wind semi-custom series, the SW96 project has Nauta Design styling both inside and out. 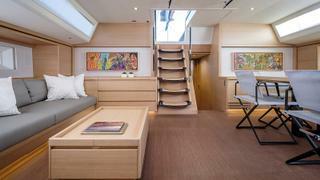 “The owner’s brief was for a contemporary deck layout and a raised saloon interior with the classic Southern Wind crew area aft because of the privacy and efficiency it offers, especially during long distance and competitive sailing,” says Massimo Gino, Mario Pedol’s partner at the Milan-based design firm. Art curator Mariella Franzoni provided a selection of artworks and suggested artists. She recommended South African artist Khaya Witbooi, who was commissioned to create the paintings for the saloon. “Every time I look at the art, I see this young man and think of his story,” she says. 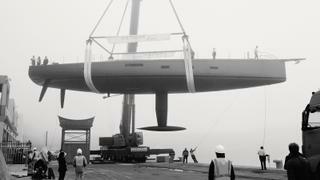 The SW96’s new features, like the lifting keel and twin rudders, brought challenges and advantages to the design team. Nauta Design integrated the high stroke of the lifting keel into a wall so that it doesn’t encumber the hallway that leads to the VIP cabin, while the twin rudder configuration has the added advantage of freeing up space aft that is used for storage and a tender garage. All of these solutions were achievable with accurate weight estimation and careful monitoring. At 56.7 tonnes lightship, the SW96 may have the specs of a racer, but her cruiser soul hasn’t been forgotten in generous interiors and systems designed for blue water — something this owner knows a lot about. 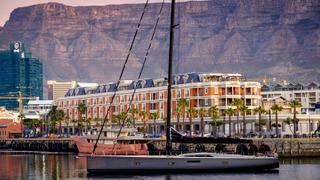 He joined Sorceress's delivery trip from South Africa, where Southern Wind is based, to the Mediterranean. “The 7,000 nautical mile voyage from Cape Town to La Spezia was a great shakedown cruise that went well with few problems,” he says. “It was a thrill to fly the spinnaker for 2,000 nautical miles from Cape Town almost to Ascension Island, but when we arrived the harbourmaster immediately warned us not to go swimming. The second SW96 was recently launched for another hands-on owner and named Seatius. Highlighting the custom in “semi-custom”, she was set up with less of an emphasis on performance and more on comfort since the owner’s goal is a circumnavigation. Whether he heads west out of Cape Town to Ascension, or sets off east, there’s a good chance he’ll one day have Galápagos sharks circling his yacht too, only perhaps this time in the Galápagos.